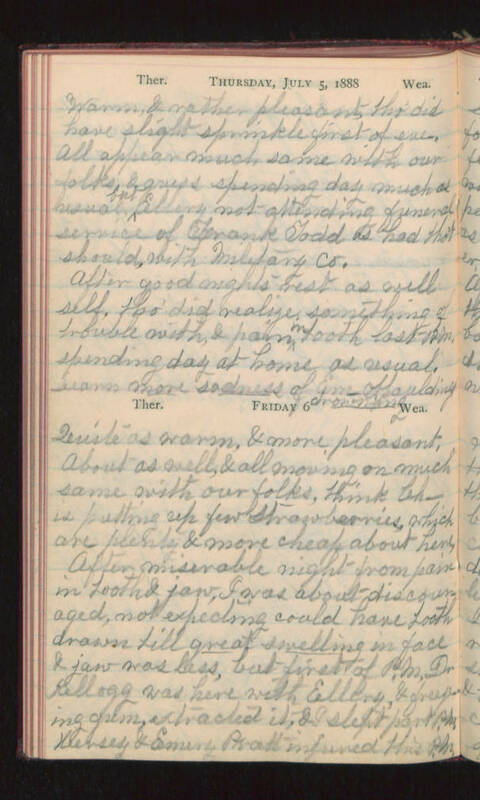 Thursday, July 5, 1888 Warm, & rather pleasant, tho' did have slight sprinkle first of eve. All appear much same with our folks, & guess spending day much as usual but Ellery not attending funeral service of Frank Todd as had tho't should, with Military Co. After good nights rest as well self, tho' did realize something of trouble with, & pain in tooth last P.M. spending day at home as usual, seem more sadness of Em- Spaulding drowning Friday 6 Quite as warm, & more pleasant. About as well, & all moving on much same with our folks, think Ch- is putting up few strawberries, which are plenty & more cheap about here. After miserable night from pain in tooth & jaw, I was about discouraged, not expecting could have tooth drawn till great swelling in face & jaw was less, but first of P.M. Dr Kellogg was here with Ellery, & freezing gum, extracted it, & I slept part P.M. Kersey & Emery Pratt injured this P.M.